Let us help you make your cheese board the STAR of the evening. Or even the entire meal! We start at 10am with a class on how to plan the perfect cheeseboard, what cheeses to choose and how to add some fabulous home-made creations. 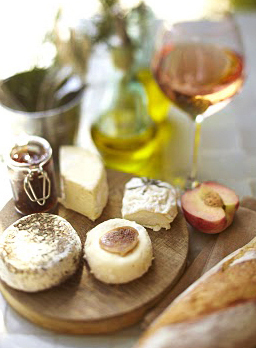 You will learn how to make your own cheese and we’ll make a thyme jelly and other delights to serve with your cheese. There will be a tutored wine tasting of local wines – how to choose the wine and how to serve it. And at 1pm we sit down to a wine-cheese pairing lunch. We start at 3pm with a class on how to plan the perfect cheeseboard, what cheeses to choose and how to add some fabuous creations (including your own homemade cheese, light herbal jellies and other delights) to serve with your cheese.. At 4.30pm there will be an in-depth tutored wine tasting of local wines.. And we finish finish with a cheese and wine-pairing apéritif. This course costs €110 per person - we need a minimum of 4 people.